in a powerful AI language, Pop11. 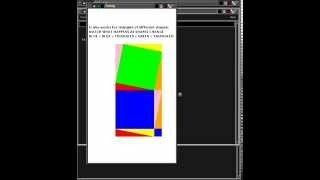 A Video demonstration of a program showing a proof of Pythagoras' Theorem. Using the Poplog/Pop11 editor Ved with keyboard function keys -- top middle and right. The programs demonstrated in these videos all use parts of the Poplog system. In particular I have created several demonstrations using Pop11, the core language of the poplog system, and the editor Ved/XVed which is implemented in Pop11. This tutorial shows how to install 32-bit linux poplog version 15.65 (the latest version, assembled in December 2011) on a linux system. The demonstration uses Fedora version 15, but the same procedure will work on other versions of linux including for example Ubuntu and Arch linux. There are slight differences in the preparation needed for different versions of linux, as pointed out in the video, and also in the installation instructions here: http://www.cs.bham.ac.uk/research/projects/poplog/v15.65/#installing. N.B. Since the video was made, two simplified installation scripts have been provided, one for users of linux based on 'rpm' packages (e.g. Fedora, Redhat, Scientific Linux, CentOS) and one for users of linux based on 'deb' packages (e.g. Debian, Ubuntu, and some others). Those scripts simplify the installation, as just one script has to be downloaded, made executable and run. The methods shown in the video will work on other versions of linux. The installation process requires some preparation of the linux system to ensure that it has the graphical libraries and also the usual compiling and linking tools (gcc). A shell script can be downloaded that will check whether you have the required graphical libraries. Then, to do the actual installation, a short shell script http://www.cs.bham.ac.uk/research/projects/poplog/v15.65/get-and-install-v15.65-poplog can be downloaded, and made executable and then run. This is all done automatically in the new scripts for rpm and deb package users mentioned above. When the 'get-and-install-v15.65-poplog' script is run, it fetches a compressed 'tar' file (size about 16.5MB), as shown in the video, and also fetches another shell script to install the contents of the tar file. The video shows what the installation process looks like, and how fast it goes (especially when using a 30Mb/sec cable broadband connection to do the download). On a slower internet link, and a slower PC than the one I used the process would take longer, but on modern machines it should be at most a minute or two. It unpacks the tar file into a new directory at the default location /usr/local/poplog (though you can change that) and after re-linking the core of poplog, and building saved images to run Pop11, the editor, Common Lisp, Prolog, and Standard ML it ends up using less than 80MB for the whole installation. Quite a lot of that can be deleted if you don't want all the four languages and if you don't want to be able to look at the system source code. NOTE: Supplying poplog using a tar file and an install script, rather than a typical linux package (e.g. deb or rpm), gives the user a lot of choice as to where and how it will be installed, compared with installation using a standard linux package in Ubuntu, Fedora, etc. It also allows the same system to be installed in two (or more) different places, so that one is for regular use while experimenting with modifying or extending another version. Please send comments and questions to Aaron Sloman at Birmingham (preferably using normal email not social web sites). NOTE: because these tutorials are unscripted, they include errors and moments of confusion! 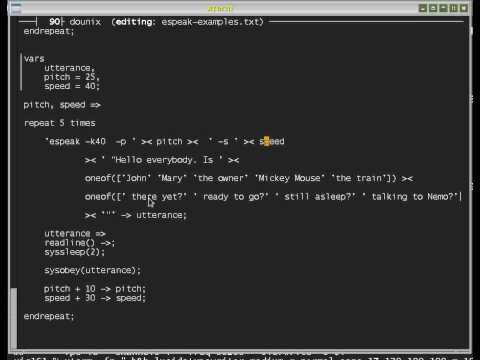 This is part of a planned series of video tutorials introducing some of the features of Pop-11, an AI programming language (part of the Poplog system). I am not an expert pod-caster, so there will be many flaws. I hope to learn from experience and from feedback from users. This is a sequel to my previous tutorial (pop-espeak). Unlike the previous tutorials this one makes use of Poprulebase, an extension to Pop11 designed for construction of rule-based systems and used in the SimAgent toolkit. "On learning about numbers: Problems and Speculations" The chapter (like the whole book) is on-line. 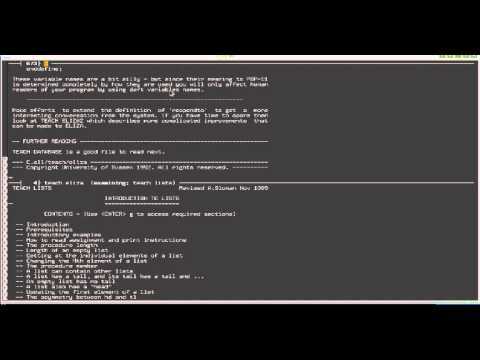 Since this video was made several of the rules in that file have had comments added to the code. The video was unscripted and there are at least two mistakes in portions of the presentation relating the program's demonstrated behaviour to the code. One mistake was to use a version of the code that included an unnecessary local variable. Another mistake was to choose the wrong rule to illustrate how one of the replies had been generated, because there are a number of slightly different rules. 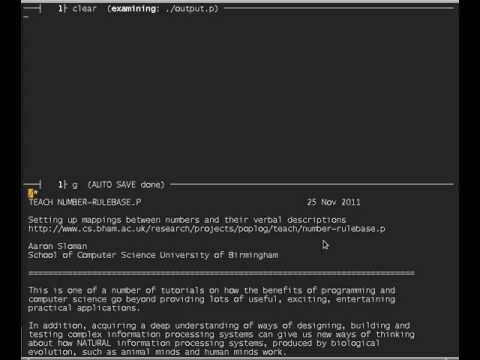 This tutorial makes use of a pop11 teach file available here http://www.cs.bham.ac.uk/research/projects/poplog/teach/random_walk to demonstrate some features of the 2-D graphical libraries available in Pop11, as well as the use of the Poplog editor Ved as an interactive learning, programming, testing and demonstration tool. The tutorial introduces a small subset of the RCLIB extension to Pop11, providing a 'Relative Coordinates' graphical package, which allows the frame of reference to be altered (e.g. moved, stretched or rotated) so that the same graphical command has different effects. However that feature is not demonstrated here. A learner trying various parameters for the face-drawing procedures should be able to work out what the parameters do, as part of learning how coordinates work. The key features of a random walk are demonstrated manually, and then put together in a little procedure that allows various kinds of random walk to be demonstrated and displayed graphically. This shows how, by playing with such a program, a learner can begin to get an intuitive feeling for the ways in which random walks can vary. The tutorial ends by mentioning that the program can be extended to collect different sorts of statistics about the random walks, which could be used as input for the Pop11 RC_GRAPHPLOT library, which draws graphs of mathematical functions or, of empirical data. So although Pop11 was designed for teaching and research in Artificial Intelligence (and cognitive science) it can also be used as a tool for doing research in mathematics, especially gaining an intuitive understanding of some features of a mathematical domain. The talk was unscripted and may have a number of errors. One that I've noticed is that on more than one occasion I referred to a delay as one second rather than one hundredth of a second (the unit for the syssleep function). 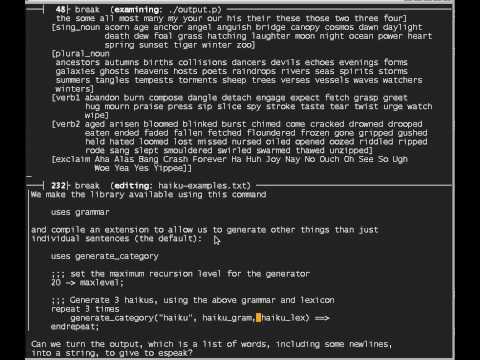 This is one of a collection of tutorials demonstrating Pop11, a language with some of the features of Lisp, Scheme, and Prolog, developed for teaching and research in AI and Cognitive Science. Most people think of pattern matching as an operation performed on strings (e.g. 'grep' in unix/linux). The matching here is on structures, including lists of items, lists of lists, etc. So the functions of matching in this context can be thought of as searching in and extracting information from a database of knowledge rather than finding and manipulating bits of text. Because the tutorial was unscripted there are some bloopers -- e.g. where I temporarily switched my brain into the wrong context -- e.g. 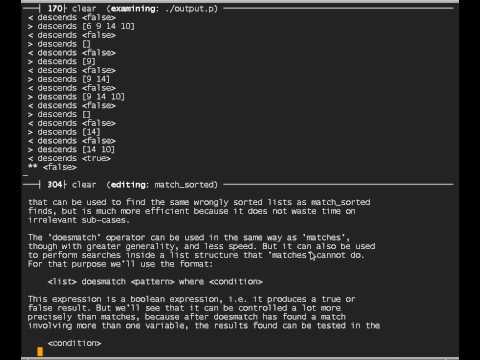 attempting to trace "matches" in an example that used "doesmatch", not "matches". The tutorial presents a fairly standard recursive algorithm for checking whether a list of numbers is sorted, then shows how that can be replaced by a non-recursive definition using the pop11 pattern matcher, which allows you to specify a sort of abstract picture of what is not allowed in a sorted list. The pop11 matcher compares that picture with an input list, and if it matches, the list is not sorted. Using the second format, the pictorial specification of what a non-sorted list is like is somewhat clearer and its use is also much more efficient, since the search for an unsorted fragment of the list is more controlled. The tutorial then shows how the procedure can be generalised to test a variety of types of list, including lists with mixed types of components (e.g. words and numbers) by allowing the test for unordered elements instead of being frozen in the code to be passed as a second parameter to the procedure. Then by using the same procedure with different 'unordered' tests we can produce a variety of tests for different kinds of ordering, all using the same generic procedure. Finally the tutorial shows how the generic procedure can be partially applied to different specific tests (forming Pop11 closures) to create different procedures, testing for different things. In retrospect I think the example may be confusing for some viewers because the task of checking whether a list satisfies a condition (e.g. containing numbers in ascending order) requires using a test that indicates a failure to satisfy that condition, e.g. a test for an adjacent pair of numbers being in descending order. That implies that a true result for the test implies a false result for the main procedure. This complexity is a consequence of the example shown being for something being true of ALL parts of a list, which is equivalent to non-existence of ANY part of the list for which it is not true. Some human brains find this hard to grasp. The process of generalisation or abstraction from a few examples of testing a list, then creating a new "generic" version of the test, by abstraction, which can then be instantiated to produce new examples, illustrates the ability of humans to learn different competences, then discover that those competences share some structure, and then use the shared structure with additional parameters to cope with novel situations. That is a common process in mathematical discovery and in becoming more competent at programming. It is often confused with metaphorical thinking (which requires continued reference to the original examples, whereas abstraction does not). I think it is an example of the notion of "Representational Redescription" presented by Annette Karmiloff-Smith in her 1992 book "Beyond modularity". Implementing representational redescription in a program is an ambitious task for Artificial Intelligence. This tutorial does not go into that. Originally this was a 19 minute demo, illustrating some features of Pop11, then going on to present the Riverworld tutorial. Instead that is now done in a separate video http://youtu.be/RrT9DUyg88M. This tutorial has been shrunk to the first 7.5 minutes of the original. This video is now a (mostly unscripted) tutorial presentation of some of the arithmetical and list processing facilities in Pop11, and the interactive mode of developing and testing programs, using the poplog editor as a development tool. A feature of this and other pop11 tutorials is that it can be used on very low cost interfaces, since it uses only a textual display to paint schematic one-dimensional pictures of the state of the world as it changes. The mechanisms used in that file are built on lower level abilities of pop11 including list processing mechanisms. This teach file is an introduction to a small subset of the more primitive mechanisms in pop11. This video is an unscripted tutorial presentation of some of the arithmetical and list processing facilities and the interactive mode of developing and testing programs, using the poplog editor as a development tool. A feature of this tutorial is that it can be used on very low cost interfaces, since it uses only a textual display to paint schematic one-dimensional pictures of the state of the world as it changes. An earlier version of this tutorial wasted about a minute on a presentation error. That version is no longer available, so please don't save links to it. A separate tutorial file Riverworld in Pop11: introduction to programming also listed below, demonstrates how a micro-world involving a man, fox, chicken and grain with a boat that holds two items and a river to cross could get across the river, subject to the constraints that the boat can hold only the man and one other item at a time, and the fox should never be left on a bank with the chicken if the man is not there, and the chicken should not be left alone with the grain if the man is not there. 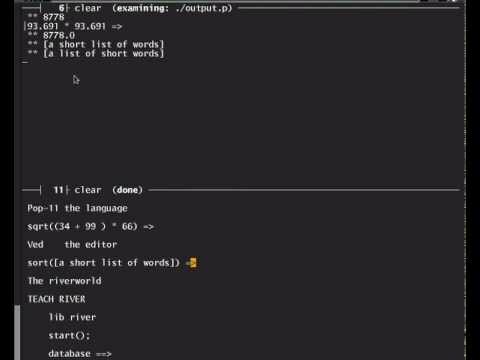 That tutorial demonstrates that the river-crossing microworld could be used to teach absolute beginners some of the elementary aspects of programming, in an intuitive setting. In contrast, this new unscripted tutorial (http://youtu.be/M-NPoGCb0q8) aims at showing teachers how to create such a microworld using features in Pop11 that allow programs to create, interrogate and alter a simple database, implemented as a list of lists. Procedures can be written that simulate perceiving the state of the world and acting on the world, and some of the manipulation procedures can be used to encode the causal laws and constraints of the world. Such a world can then be used in a variety of contexts for student exercises, e.g. natural language interaction relating to the world, planning, problem solving, reasoning, etc. The tutorial is merely an introduction. There are many directions that can be taken, depending on the educational goals, the background and interests of the students and their abilities. NOTE: because this tutorial was unscripted, I made some minor errors wasted about a minute in the original version. I later was able to edit it on Fedora 15 using PiTiVi, to remove the unwanted episode. So a new version has been uploaded. Youtube does not allow an old faulty video to be replaced, so the new version had to go to a different location. This video is a tutorial presentation of some of the key ideas in that teach file, while also introducing the use of the poplog editor Ved as a programming environment, and some of the ways of using pop11 for interactive programming. This teach file introduces the river-crossing puzzle: get man, fox, chicken, and grain, across a river using a boat that can old only the man and one other item, without ever leaving the fox with the chicken, or the chicken with the grain, on a bank without the man present to prevent a vulnerable item from being eaten. Students are first asked to work out a solution away from the computer and then they try to express their solution using a specially developed 'micro-language' for the river world, with commands like putin(fox), takeout(chicken), getin(), getout(), crossriver(). When a sequence of instructions solving the problem has been found it can be made much shorter and clearer by defining new procedures for invoking frequently used sequences of instructions. Teachers can, of course, copy and edit the library program, the teach files, or other files that are used by this one, or which build on it. This illustrates the use of microworlds for teaching important concepts and techniques, especially in symbolic Artificial Intelligence. This is one of several tutorials based on the river world. An earlier tutorial showed how a teacher could use the list processing and pattern-matching features of pop11 to set up a microworld like the riverworld, which could the be used as a basis for a number of different learning scenarios for beginner or more advanced programmers. Pop11 is an AI language with a general purpose-core that is in some ways like Scheme, in other ways like Forth (use of an open stack). This tutorial demonstrates some of the main "built-in" data-types (integers, decimals, complex/imaginary numbers, strings, words, lists, vectors, properties and procedures), some of the kinds of programming constructs, for referring to entities (expression formats), including expressions for referring to or constructing examples of all the above entities, the use of the poplog open stack, and some of the control constructs provided, including use of nested loops vs use of parallel loops. The latter is an unusual, but very useful feature. Nested loops can be used for doing something to all possible combinations of items from several different lists. Parallel loops repeatedly do something to a group of items, one selected from each of several different lists, so that each list item is used only once. The loop stops after all members of the shortest list have been used. Most of the tutorials on this web site make use of the Poplog editor Ved, or its multi-window version XVed, to demonstrate features of AI programming, testing of programs, searching for documentation, editing program code, etc. This short video (just over 9 minutes) illustrates uses of Xved and Ved that invoke some of Pop11's 2-D graphics capabilities, including handling multiple text windows, using (user definable) graphical menus, and running programs that invoke graphical displays. It was originally intended as an introduction to a longer tutorial on the uses of the editor. However, it made the tutorial too long, so I separated this from the main tutorial which is the video that will be uploaded after this (Essentials of Ved, the Poplog Editor at: http://youtu.be/h8zv_un5k3k) and the Ved Keys tutorial, below. The video quality of this tutorial is very poor for some reason. So I may replace it later. The next tutorial, will show the Ved editor being used in single window mode, and will present the most commonly used keyboard commands for getting things done. 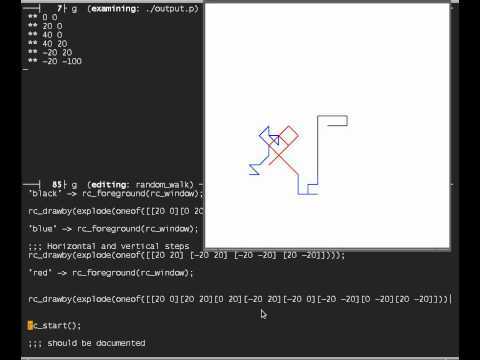 The previous tutorial (http://youtu.be/Athf7cFbk3E( rapidly ran through some of the things that can be done with the Poplog editor XVed, using its 2-D graphical capabilities. including use of multiple windows and mouse drive menu panels. 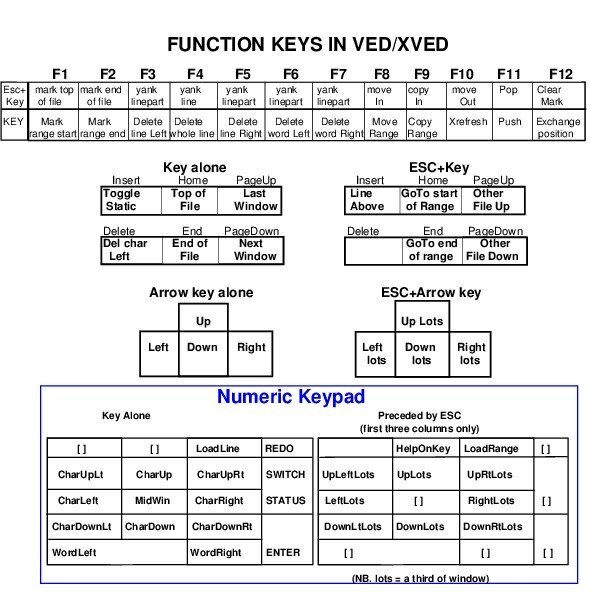 This tutorial goes to the opposite extreme to show how Ved can be used not only without 2-D graphics, but also without any function keys, so that it has to be driven only by normal alphanumeric keyboard keys, along with CTRL, ESC, RETURN, and Backspace. This situation can arise when either there is something wrong with a keyboard, or the keyboard is small and lacks function keys (e.g. on a laptop), or the use of the function keys is not available to Ved because they are 'grabbed' by the operating system or graphical desktop interface. In such a situation it is possible to drive Ved and do normal programming, development, testing, and reading of documentation, using only a minimal set of keyboard keys, namely all the alphanumeric keys plus the CTRL and ESC keys. This tutorial explains how to move the Ved cursor around, how to delete text, how to mark portions of a file, how to mark and compile portions of a file, and how to switch between different files, while using nothing but the minimal set of keyboard keys. 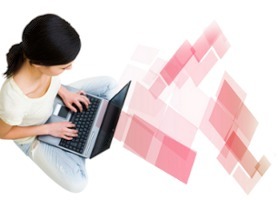 There are other help files that explain additional actions that can be performed using the keyboard, and without a mouse or 2-D graphical facilities. NOTE: because these tutorials are unscripted, they include some minor errors and moments of confusion! The previous tutorial demonstrated some of the things that can be done with the Poplog editor Ved/XVed without using any function keys, only normal keyboard keys and the ESC and CTRL keys. This tutorial goes beyond that to show how many of the operations can be performed more economically using function keys on a standard PC keyboard. In fact, as shown in the demo, the marked range can be compiled using CTRL D, which is probably more convenient for most people than ESC followed by keypad '*' key. In the previous tutorial, while demonstrating the use of numeric keypad keys in the poplog editor, I attempted to demonstrate the use of the '*' key on the keypad to compile a number of lines of Pop-11 code, which had previously been marked, using the Mark Start and Mark End function keys. Later I realised what I should have done, and so this tutorial is a supplement to the previous one, partly repeating the previous one and also correcting the mistake at the end of the previous one.